Today is a very relaxing day – just spending the Sunday watching some crafty YouTube videos and watercolouring in the Painterly Days watercoloring book that just arrived in my letterbox. It is by Kristy Rice who is a fantastic watercolorist and you can find her online (her website is here if you want to find out more about the colouring books – there’s three of them!) and on YouTube. If you like watercolouring or colouring books, seriously check them out – I have been LOVING painting in mine. I’ve been neglecting my blog lately. I don’t know why because I’ve been making tons of cards and drawing and making art journal pages – and I want to share them all, but for some reason I have been resisting opening the laptop! I think it’s because I’m in the process of setting up my own website and moving my blog to WordPress which I have NO idea how to use haha! So I’m overwhelmed with new computery things to do that I just want to go back to the craft table! 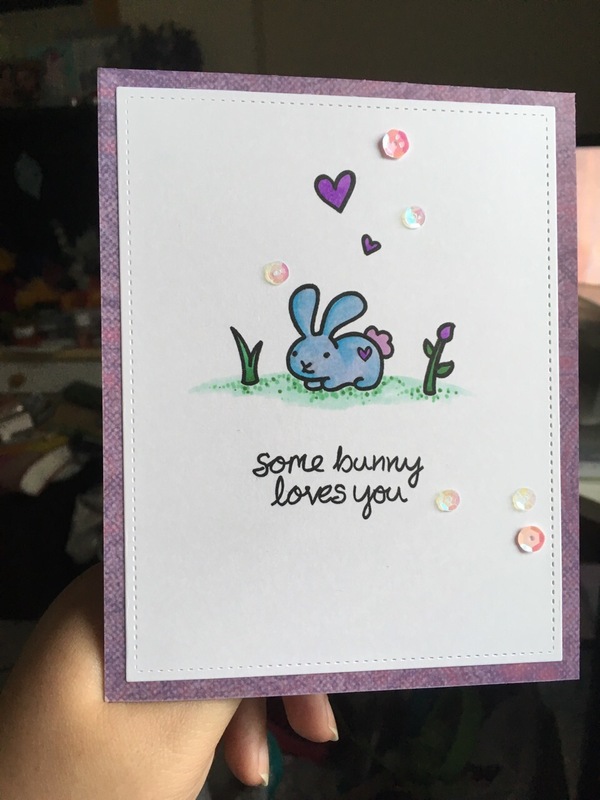 For the super cute bunny card I used the Lawn Fawn ‘My Silly Valentine’ stamp set and the little grass elements are from the Lawn Fawn ‘Gleeful Gardens’ set. I stamped them in Simon Says Stamp Premium Dye ink in ‘Intense Black’ on Neenah 80lb Solar White cardstock and then coloured the images with Copic markers. I then matted that on some purple pattern paper from my stash and used a heavy purple cardstock as the card base. I added a few pretty sequins from my stash. For the inside I added a strip of the same purple pattern paper and then stamped the bunny image with Simon Says Stamp Hybrid ink in ‘Hot Mama’. Hard to see the embossing powder here. It was a very dull day. You can see the shine here. 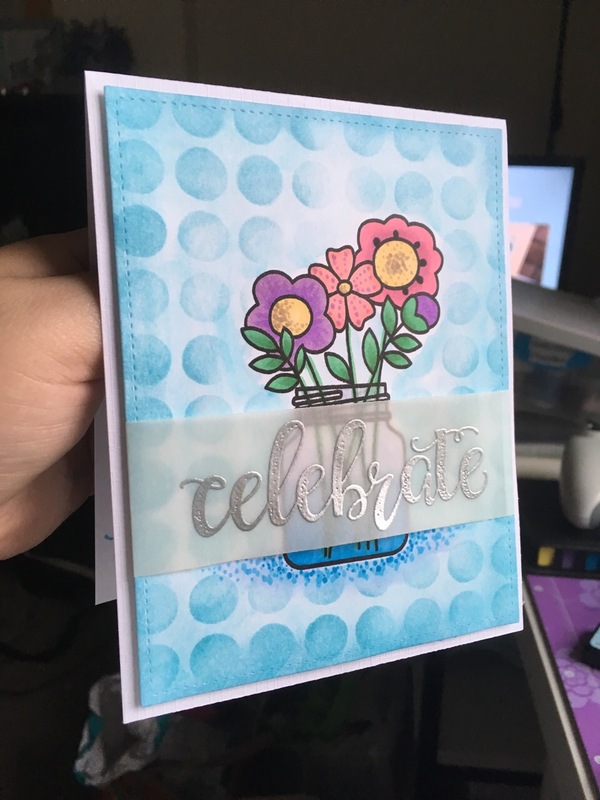 I just love embossing powder! For the celebrate card I stamped the flowers in a jar image from Paper Smooches ‘Best Buds’ stamp set with Simon Says Stamp ‘Intense Black’ ink on 80lb Neenah Solar White cardstock. I also coloured this in with my Copic Markers and then used Distress Ink in ‘Tumbled Glass’ to make the blue background. I just stamped it onto a ceramic tile and added water and basically watercoloured the background with this. I was careful not to go over areas too much as this cardstock is not meant for watercolouring and would pil if overworked! After that dried I went over the whole thing with a big dot stencil and some more ‘Tumbled Glass’ and a Ranger Mini Blending Tool. 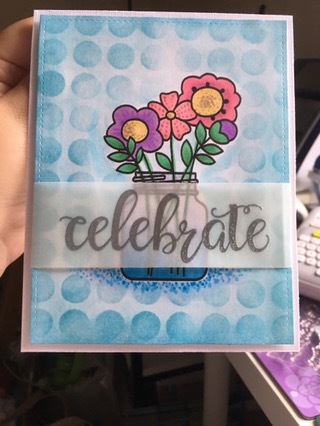 I cut a vellum strip and used Inkadinkado Anti Static Powder Tool all over that strip and stamped the word celebrate from the Avery Elle ‘Big Greetings’ stamp set in Versamark ink. I then heat embossed the sentiment with Simon Says Stamp ultrafine embossing powder in Silver and folded the vellum piece around the cardstock. I then popped that panel up with 3M Double Sided Foam Tape. For the inside I stamped Happy Birthday with Tumbled Glass (I used the Mini Misti Stamping Tool to get a clearer impression) and stenciled in a bit more of the big dots in the corner with more Tumbled Glass Distress Ink. So I’ll leave it here for today. Hopefully I’ll have links working down below soon to products I used. Let me know what you think in the comments 🙂 Have a great day!! Previous Post The Waiting is the Hardest Part!